Ohh the rebecca Minkoff is tempting but the look for less is just to similar to not take the steal! While this particular style isn't exactly "me," I'd have to say that the splurge is probably worth it. Even in photos, the leather looks luxe! On this one occasion I think I would rather the more expensive version. It looks a bit more structured. Unfortunately I can't afford it at the moment! that's a lovely bag replica ! I'd have to splurge on this one. If handbags aren't fabric, only leather will do for me. I'll have to watch my budget this week! I love this post. Is this a regular sunday post? I hope so!! I'm constantly amazed at your finds, this one is so good! I'm a tightwad this time around, I just like the bag better. the Rebecca Minkoff bag is gorgeous but the steal is so much more affordable! great find!! Love both versions, though I'm always wary about cheaper versions of bags falling apart. But this is definitely a great alternative if you're on a budget! I think Ms Minkoff's creation has stolen my heart today! I am totally plagued by a craving to splurge, darling! I love the High Fashion Handbags, much better. I love the look of the cheaper version. I am more of a shiny kind of gal. The other expensive one looks too matte for me. Handbags are the one thing I always seem to splurge on, so I just don't think I can resist that Rebecca Minkoff! I do love the original but the steal is a great price--and very similar looking! Would love to own the Minkoff! 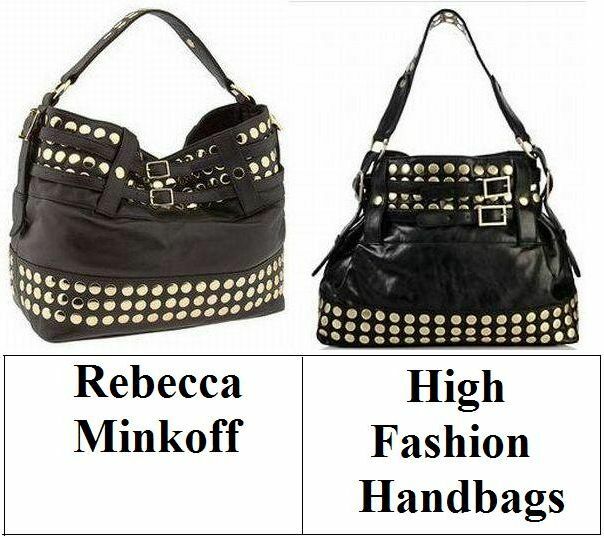 I really like the soft leather look of the rebecca minkoff bag; gotta love the studs! I think the splurge is definitely a good deal. It's very similar to the original! what a nice price on the fashion one..the cheaper one, I mean. They're both cute but I'd definitely go with the Rebecca Minkoff one... It would add just a touch of luxury to any look! This time I choose Rebecca Minkoff! Ooo, what perfect handbags. I can imagine wearing either one all the time. They both look fantastic, but I do think the Rebecca one looks better. I don't have the money to afford it, but it would definitely be a wonderful gift for the right girl. ooh, i love finding great lookalikes but i think i'd splurge on this one! The Rebecca Minkoff is soooo pretty! You know I'm a sucker for handbags :) It's the one item I don't mind splurging on! I like the cheaper one better!!! Love the studs on both though. Great find, as usual! Hope you had a nice weekend. I love your find, Erika, but this time it would have to Rebecca or nothing for me! I can't resist a Minkoff. Loooooove that one! I love RM's work but you certainly pay for it! So, for $39.90, I will be thrifty!